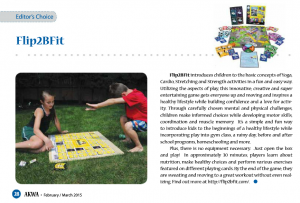 Congratulations to our ClientÂ Flip2BFit for their feature in AKWA Magazine! Flip2BFit introduces children and parents to the basic concepts of Yoga, Cardio, Stretching and Strength activities in a fun and easy way. Utilizing the aspects of play, this innovative, creative and super entertaining game gets everyone up and moving and inspires a healthy lifestyle while building confidence, a love for activity and strengthening the bond between family members. Through carefully chosen mental and physical challenges, children make informed choices while developing motor skills, coordination and muscle memory. Itâ€™s a simple and fun way to introduce families to the beginnings of a healthy Lifestyle that they can enjoy together. Plus, there is no equipment Necessary. Just open the box and play! A board game like no other creating healthy lifestyles today that will last a lifetime ahead. Check them out at flip2bfit.com!